When you are making a deep dive, you will need to equalize the air spaces in your skull known including the spaces in your ears. This is nothing new and perhaps one of the first things you learn when getting your dive certificate. The need for equalizing these air spaces is because the pressure will increase as you descend causing a sharp pain. The same is true with your scuba mask. A mask squeeze is where the increase in pressure causes inequality in the air spaces between the mask and the face. This causes the mask to press hard against the face and can cause a lot of pain. To prevent the mask squeeze, you will need to equalize by exhaling through your nose. While it gets obvious when you are having a face squeeze some of the symptoms include reddening eyes, nose bleeding, vision changes, and facial bruising. Check out what is the definition of a squeeze in scuba diving. You will need the services of a medical practitioner or doctor if you are experiencing blurry vision or your eyes are reddish or swollen. This however is rare and most people will not get to this point. Other facial injuries are more common and you will need to take time for the body to reabsorb the blood on your face and the swelling from the mask squeeze. It is one of those situations where you will look worse before you can get better. Your face will appear black and blue, swollen all over and as if you are a boxer who couldn’t defend himself and took one too many punches. Remember to always observe the 5 scuba diving safety tips and solutions. Who usually gets mask squeeze? It is the new diver that is more likely to get mask squeeze. They get this because they are overwhelmed with all the information that they need to remember when making the dive such as equalizing the sinuses and the ears, buoyancy control all while viewing the sights and scenery around them. Check out the beginner guide to ice diving. However, it’s important to note that more experienced divers will also experience face squeeze especially when they are excited about a new experience which distracts them from the usual diving procedures. They may also have a new dive mask and may not be used to using it. Sometimes having facial hair or head hair stuck inside the dive mask may cause problems with equalizing the mask. How to prevent mask squeeze. 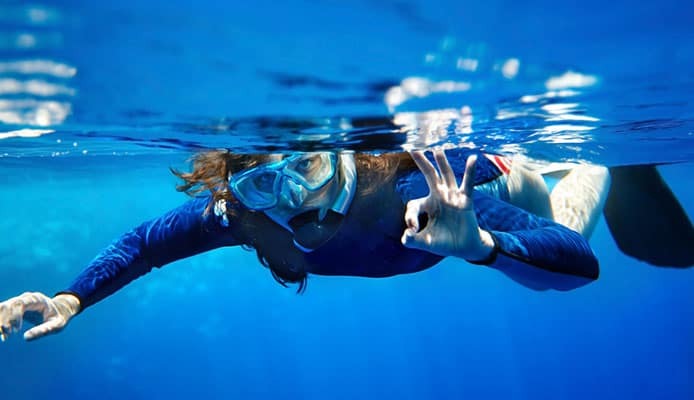 In order to prevent mask squeeze from happening every diver should allow the nasal passages to be open during the descent. You can use your nose to exhale and ensure that the mask you are using fits your facial structure properly. This helps to significantly minimize the risks of having barotrauma. When you are wearing the dive mask, it should fit nicely around your face. You should be able to achieve a good and nice seal when you put the mask on your face and exhale through the nose. How to tell that the mask is fit for your face is when you place it gently and inhale, it sticks and doesn’t fall off even without having the straps in place. Don’t be surprised however if you find that there is a bit of leakage when diving. That is completely normal. You can get rid of any water that finds its way into the dive mask by tilting the head to the surface and exhaling. Often divers will exhale through their noses without realizing and in fact unconsciously prevent the face squeeze. However, if you are a diver who is used to performing mouth only exhalation, you will need to exhale through your nose to prevent this. And the mask is not the only thing that needs to fit right. Ensure that your wetsuit, dive gloves and scuba fins are all the right size. The main areas around the face that will be affected by a mask squeeze include the forehead, the check and the eyes. If the situation is severe then the diver may have bruises around the cheeks and around the eyes. What’s more is that the diver can get subconjunctival hemorrhage where there is bleeding between the transparent layer between the eyes and the white of the eyes. This is what would cause the red spots in the eyes. In some divers the whole eye ball may turn red. The good thing is that even while some these injuries may appear quite sever and scary, they do go away by themselves. Always keep an eye on the dive computer to keep track of your dive stats. 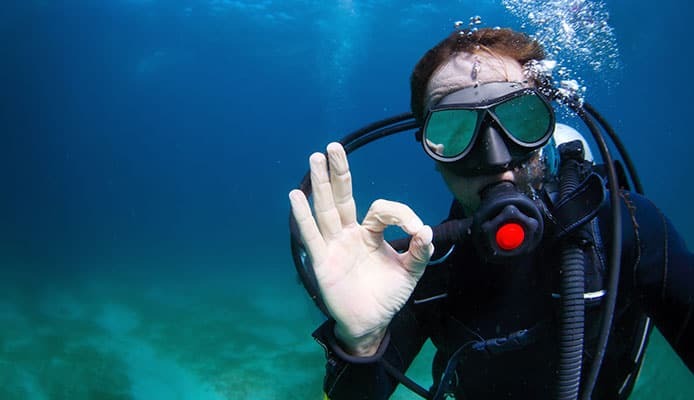 The last thing you want when enjoying the beautiful sights during your scuba dive is a mask squeeze. While the after effects will give you a less pleasant look, all you will need to do to prevent this is to exhale through your nose and into your mask as you make the descent. How to avoid a mask squeeze, scubadoctor.com.